I haven't posted any ice cream since June 19th, when I shared the Chocolate Raspberry Ice Cream with you. Compared to last summer when we usually had at least 2 different kinds of homemade ice cream in the freezer at all times, this is kind of odd. I definitely haven't lost my mojo for homemade ice cream. The problem is that I developed a recent obsession with root beer floats. Obsession as in, eating one (sometimes two) a day. It's probably time to put this obsession to a stop. So, I've stopped buying root beer and vanilla ice cream. I'm pretty sure this mocha almond fudge ice cream wasn't the best way to end the root beer float obsession, but it did manage to last over a week in our freezer...so maybe it's a step in the right direction? A few weeks ago when I hosted the giveaway for Six Flags tickets and asked readers their favorite ice cream, someone mentioned Mocha Almond Fudge ice cream. I couldn't get the ice cream flavor out of my head and I immediately Googled it and stumbled upon a recipe. I've included the full recipe below, although instead of making the fudge swirl they suggested, I used my own homemade hot fudge sauce that I had in the fridge. 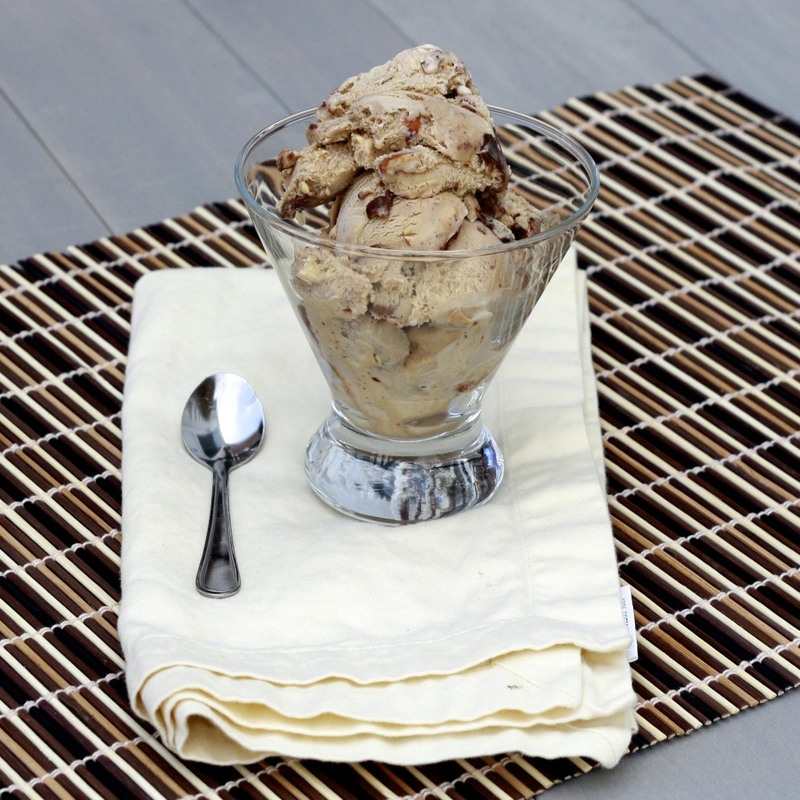 The flavor was as good as it sounded--the ice cream has a strong coffee flavor and the blend of textures thanks to the almonds and fudge sauce made every bite an unexpected surprise. As much as I loved plain coffee ice cream, I think this gets a gold star for its added features! Any of you dealing with some current food obsessions lately? Hopefully they're healthier than mine! 1. Toast nuts on a baking sheet for 8-10 min at 350F. Set aside to cool. 2. In the top of a double boiler, heat the milk with the instant coffee over simmering water until steaming. Remove from heat and stir until instant coffee powder is dissolved. 3. In a bowl, whisk the egg yolks until blended. Whisk in the sugar and half of the hot coffee mixture. Pour the yolk mixture into the remainder of the half and half. Stir and cook over simmering water until the custard coats the back of a spatula (about 10 minutes). Place the custard bowl in a pan of ice water. Stir occasionally until it cools to room temperature. Strain the custard mixture through a fine mesh sieve. Add the whipping cream and stir. Refrigerate until thoroughly chilled, at least 3 hours or overnight. 4. To prepare the chocolate fudge, combine the sugar and cocoa in a small saucepan. Add the corn syrup and half-and-half. Place over medium heat and stir constantly until mixture boils. Reduce heat and simmer for 2 minutes. Stir in the butter and vanilla and allow to cool to room temperature. 5. Freeze the custard in an ice cream maker according to manufacturer's instructions. 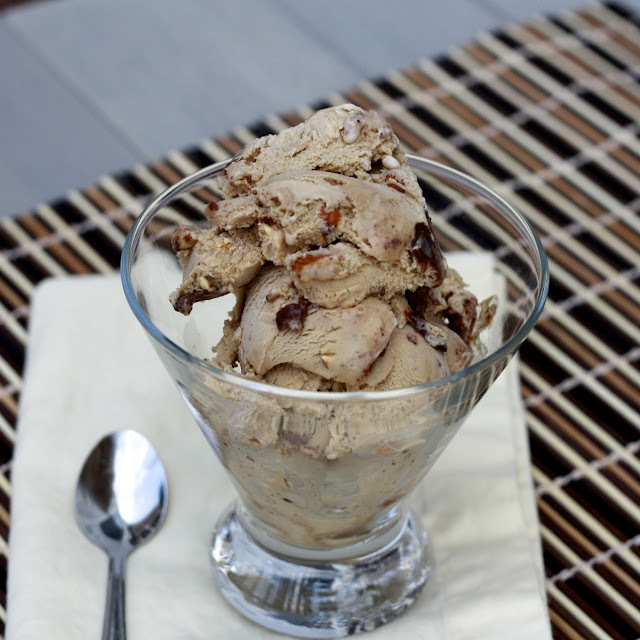 When the ice cream is almost frozen, add the toasted almonds. Spoon the ice cream mixture into a container, alternating ice cream with spoonfuls of the fudge. Cover and freeze until firm, about 2 hours.